Nepal is the perfect destination for backpackers because it is small, cheap and safe. It also offers a huge variety of activities and has an easy visa process. Backpacking in Nepal is a great way to experience the more touristy areas, do some trekking and also get off the beaten path and see the rural life of this welcoming and incredibly beautiful country nestled in the Himalayas. We spent one month in Nepal which is the normal visa length and also a perfect amount of time to trek, relax and see some of the lesser known parts of the country. Here is all the basic info you need to navigate your way around Nepal and make the most of your time there. ATMs are widely available but charge a fee of 500 NPR. We didn’t find any that didn’t charge fees. Credit cards are accepted at some hotels and restaurants in the cities. Citizens of most countries can get a visa on arrival in Nepal simply by filling in the application and paying the fee, $40USD for 30 days for most nationalities. There is also an option for 90 days. At Kathmandu airport you can fill in the application on a computer and take the receipt to the payment counter. *Note* You can’t pay for your visa in Nepalese or Indian rupees so make sure you have another major currency with you e.g USD, GBP, EUR, AUD. There is a currency exchange office there and you can also pay by credit card for an extra fee. SIM cards are available to buy at the airport and this is probably the easiest way to do it. As a tourist you will need a passport photo and to fill out a form. There are two main companies, NCell and Nepal Telecom (NTC). Both counters at Kathmandu airport have a list of options and prices which are fairly similar. In 2018 it cost 800 NPR for a SIM card with 2.5GB valid for 30 days. Nepal is a very affordable country to travel. For budget travellers there are plenty of cheap options for food and accommodation but the large tourism industry means there’s some more up-market options too. If you are trekking with a guide and porter this will add considerably to your budget. We spent an average of €35/$40USD per day for 2 people including visas and trekking permits but not flights. We stayed in private rooms and ate mostly at local restaurants but also has some days of splashing out in the brilliant cafes of Pokhara. We did 7 days of trekking without a guide. Never have I yearned for the German autobahns as much as in Nepal (driving in the Balkans was a close second) Getting where you want to go in Nepal always takes longer than you think. Leave yourself a full day to get to a new place and be flexible if you’re travelling outside of the main tourist route. We set off one morning only to wait 4 hours at a road block until it opened meaning we spent the entire day travelling a couple of hundred kilometres. Nepal doesn’t have a rail system so all budget travel is done by road with a huge variety of buses running between easy to reach places and shared jeeps traversing the hills to the more remote areas. Buses are classed as either ‘local’ or ‘tourist’, the tourist buses are used by locals too but used to indicate a larger, more comfortable bus. The local ones can be cramped and stop more often but are, of course, cheaper and necessary to use if you are going to anywhere off the beaten path. Shared jeeps will take you to/or from the trek starting points and up into the hills to places such as Ilam. Prices are usually fairly fixed but can be negotiated if you’re a group. For Ilam there is a ticket counter at either end. Nepal is known for having some terrible roads and very high death tolls. But there seems to be constant work happening on the road and lots of the major routes have newly sealed roads. Avoid travelling by night. If you have a bit more money or want to experience something super scenic there are flights between Kathmandu and Pokhara in a tiny propeller plane. They cost a little more than the buses but take much less time and on a clear day have some epic view of the mountains. We loved Nepalese food although, as with anywhere, it can get a bit same-samey after a while. Traditional dishes include momos (filled dumplings), noodle soup and dal with rice. These are available along with some Chinese noodle and rice dishes and Indian curries at most local restaurants where a meal costs 60-180 NPR. In Kathmandu, Pokhara and to a lesser extent the area around Chitwan you’ll find Western restaurants and more up-market local food where a meal can cost anywhere up to 600 NPR. Some of these places are actually really good and if you’ve been travelling for a while will provide a welcome break from Asian cuisine. The cafes in Pokhara do a breakfast to rival some European cities and you can get a real coffee. Besides the main tourist stops you won’t find accommodation listed online and it’s best just to turn up and ask around. Even in the tourist towns this method can save you a few bucks. Accommodation standards also vary greatly between the tourist areas and anywhere else in the country. We stayed in both clean, light, comfortable rooms and damp homestays with cockroach buddies. For some of our accommodation recommendations check out our Nepal itinerary. The weather in Nepal varies a lot between seasons. December to February is winter and will be extremely cold if you attempt any trekking at high altitudes. The lowlands will be pleasant. March to May it is warm and mostly dry this is one of the peak times for trekking, some parts of the country will also be very warm coming in to summer. June to September is monsoon time and most places will be very wet. It’s still possible to travel but lots of the trekking may be dangerous due to flooding and landslides. It can also be very hot in the cities. October to November is another popular season with agreeable temperatures and clearer views after the rains. This is also peak season so expect tracks to be busier and prices to increase. Nepal is becoming very aware of environmental issues and their impact on the daily lives of its people and tourism industries. 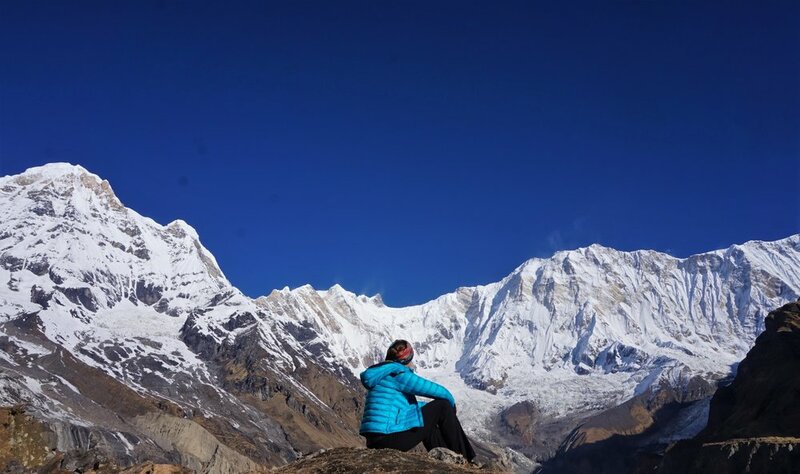 The Himalayas are one of the most obvious examples of the effects of global warming and the Nepalese take pride in their environment as the trekking trails are a huge source of income for the small nation. Plastic bags are banned in theory but not in practice. Many shops still offer plastic bags but there are alternatives available and most tourist areas will provide non-woven bags or linen bags to buy. Plastic bottles are banned on parts of the trekking routes and there are increasing amounts of options for refilling water bottles at cafes, restaurants and guesthouses. One of Nepal’s biggest environmental concerns is the air quality in Kathmandu. Locals often wear masks and the dust and exhaust fumes can cause problems for many tourists who aren’t used to low air quality. Many visitors buy a mask if they are there when the air is particularly bad, usually before the monsoon. Make sure you are conscious of your use of plastic, take your rubbish with you from the treks and be careful when deciding about animal encounters in the national parks. For more ideas read about our favourite eco-friendly travel accessories. Backpacking in Nepal is an amazing experience and the country ticks all the boxes for backpackers; cheap, easy to get around, great things to do and see and helpful and friendly locals. Have more questions or has something changed since we were there? Let us know in the comments! Newer PostTop Places to Visit in Cuba That You Can't Miss!